*If you need a hole cutting in your 600mm back support please choose that option and email dave@examdividers.co.uk to tell us the length and height of the hole you require. Improved 6mm thick panel design with more flexible arrangements possible. Joining piece can slide along the back support to go anywhere, even right to the corner. Use the customise button to create a set to suit your needs. If you need help send us an email with your room layout and what you would like and we will give you advice on what could work for you. If you have chosen the 600mm back support 'with hole' please email dave@examdividers.co.uk with the length and height you would like the hole to be. It will be cut centrally on the bottom edge of the panel unless you tell us otherwise. 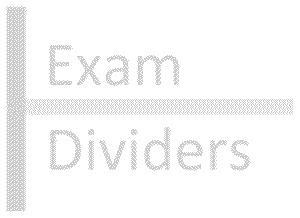 Copyright © 2018 Exam Dividers LLP, a company registered in England and Wales (OC398352). All rights reserved.